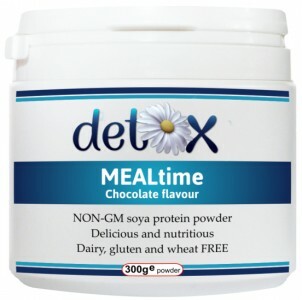 A dairy-free, gluten-free chocolate-flavoured meal replacement and protein powder that has been fortified with a wide range of beneficial vitamins, minerals, nutrients and herbs. An ideal supplement and flavour for slimmers, particularly in the early stages of a weight loss plan when cravings for chocolate can be at their worst! High in vegetable protein and complex carbohydrates, this daily shake also contains beneficial dietary fibre from psyllium husks, which promotes natural colon detoxification and cleansing. Naturally low in fat, low in calories, no added sugar or salt, yet high in nutrients - the perfect light meal or healthy snack! Also available in original vanilla flavour. NOTE: MEALtime (Chocolate Flavour) contains a minimum of 10 servings per tub, based on a 28g serving. The total number of servings will vary between 10 and 12 (based on 25g powder per serving). Contains soya isolate, apple powder (organic), rice flour, chocolate flavour, psyllium powder, vitamins and minerals, stevia extract, aloe vera extract and Siberian ginseng extract. NOTE: The soya used in MEALtime (Chocolate Flavour) is not genetically modified (NON-GM) - it comes from an Identity Preservation programme, which controls and documents the soya from planting to processing and distribution. 1 - 3 servings per day. NOTE: The ingredients in MEALtime (Chocolate Flavour) are as close to natural as possible in order to maintain the highest possible nutritional content, status and therefore benefits. Processing of the included raw materials (such as soya, psyllium husks, apple etc) is also kept to a bare minimum. As a result, the powder consistency and blending with liquids is unlike other highly processed, dairy-based meal replacements on the market. As we do not use any flow agents, additives, preservatives or emulsifiers (such as those used in other protein shakes), the blending process is a little slower. Add 2 heaped scoops of the powder to the liquid and stir. Add chopped fruits and berries and blend into a delicious, filling and highly nutritious smoothie, protein shake or meal replacement. For a frothy effect, use a hand-held frother or blender.